ResidentDante: Hardware tour: Nineties flashback! 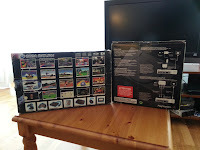 It came in it's original box together with five games! ...and no, this isn't 1995. You wouldn't be blamed to think so though! We all know that Sega ended it's hardware production after the Dreamcast. Much thanks to how badly the Saturn did the generation before it. It's a missed link in my gaming experience, so I decided to buy one. Here are my thoughts. A little history recap first. At the end of the 16-bit era, Sega experimented a lot with add-ons to it's successful, yet beaten in sales by Nintendo's famous SNES system, Mega Drive (that's the Genesis for Americans) to help keep the system popular. 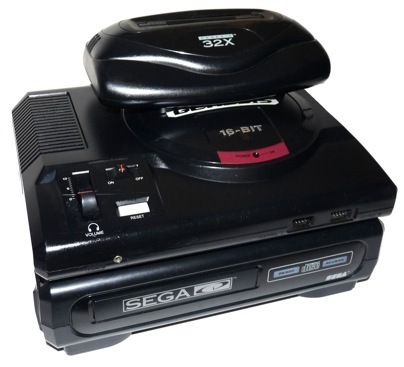 First they released a cd-rom add-on, the Mega-CD, followed by a sort of "in between generations" 32-bit add-on named the 32X. 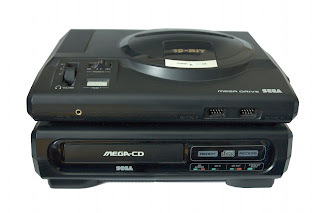 While the Mega-CD had some potential in pioneering the cd-rom age which began around it's time (PC's back then usually went under the "multimedia" pc name when a cd-rom and speakers where added) and the idea of the 32X as a cheaper introduction into Sega 's, at the time, superior 3D arcade games. These add-ons were probably both made with the best of intentions, but only served to harm the Sega company with poor sales. The add-on hardware was expensive and wasn't a true new console, upgrades to existing consoles has never been positively received in the console market. Their low sales resulted in very few titles being developed for them. In hindsight, Sega simply should have stuck at it's main 16-bit gun and continued to put money into Mega Drive titles rather than add-on hardware. The Mega CD and 32X add-ons never became the success Sega hoped for. The rush for the 32-bit generation began when Sony announced they were going into the console market, after Nintendo booted them out of the SNES-CD add-on to favour Philips (a project which ended up with no results). Sega supposedly changed their Saturn build hastily after seeing the Sony Playstation's specs, from being a powerful 2D games console to a 3D one. Sega had most likely envisioned 3D games to be exclusive in the arcades and the 32-bit generation continuing the 2D trend. Sony proved them otherwise and foresaw how the gaming industry was changing rapidly. A sudden advancement and change was happening, 3D games were becoming something you could bring into your home from the arcades. While the so-called "fifth generation" consoles brought arcade ports home at a cost, they were never as polished as the arcade titles, they would ultimately mark the downfall for arcades around the globe. Bringing the expensive and cumbersome arcade machines straight into everybody's homes. This rumoured haste in the SS hardware didn't help the console to have the power to compete to Sony's PlayStation. The SS featured two CPU's and two GPU's, a bold move for the mid-nineties. One GPU for 2D graphics and the other for 3D. Making it very difficult for developers to port games too and develop for it. It may have been how the PlayStation 3 nowadays has the difficulty of many cores to program for, only much worse. On paper SS is indeed a powerhorse, but it's structure was to complex for developers to spend extra development time for. This hampered the SS release games, which all were famous 3D arcade Sega games and eagerly awaited by fans. At a games show, a month before Sega were going to unveil the Saturn, Sony dropped a bomb and featured famous developer Namco by it's side with it's large library of 3D arcade games and a full 100 dollar lower price than the SS. To make things worse, Sega hastily released the console un-announced to exclusive retailers, which again started a fury with other retailers, going so far as banning the SS from their shelves for the lack of support and trust from Sega. The early release, dubbed as the Saturnday, stole the opportunity from third-party developers to finish their games, cancelling a large number of them for the SS and a few of them making their way to the PS1 instead. Small third party developers rely heavily on these launch games, as they may not have the money to build triple-A titles, but get a chance when new hardware makes their games look fantastic despite the lower development costs. All this and the fact that Sega's own arcade ports ran badly, made SS lose hardware ground. Fast. 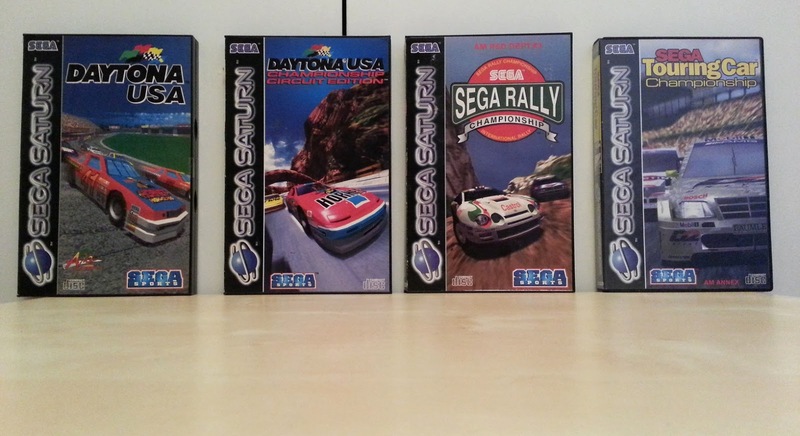 A heavily improved second wave of titles released the following year, 1996, like Sega Rally, Virtua Fighter 2 and the reworked Daytona USA Circuit Edition. It proved the SS had the power to showcase very good games and keep up with the PS1. The console release had been hampered though, and these great titles came to late, even though these were heavy brand names at the time of release. Sony won the 32-bit console battle and by 1997 Sega were really struggling and finally in 1998 the SS was lowered to it's coffin. 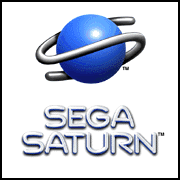 Although the Saturn only featured around 250 titles in the West, Japan saw it's success (half of the SS consoles ever built were sold here) of around a 1000 titles released and the production of consoles as late as 2000. However in the West in 1998, Sega pulled the plug on a console that was making the company bleed money. Later we saw the sales of the PS1 reaching 100 million plus, while the SS hardly reached 10 million. Sega had lost, and the amount of market and money they lost on the SS harmed the company in a terrible way. So bad in fact, they never really recovered. My SS was obtained through a seller from England on Ebay (the console was fairly popular over there) and is in beautiful condition. In fact, the console itself looks almost new. It's a Mark 1 model, recognised by the oval shaped power and reset buttons, the later Mark 2 has round ones, but is very similar looking otherwise. It may have been a fairly bulky machine back in the day, but by today's standard, at least compared to the first models of the Xbox 1, Xbox 360 and PS3, it really isn't that big. I like it's design, it looks stylish and has kept well through the years. I may actually like the look of it better than the original PS1. 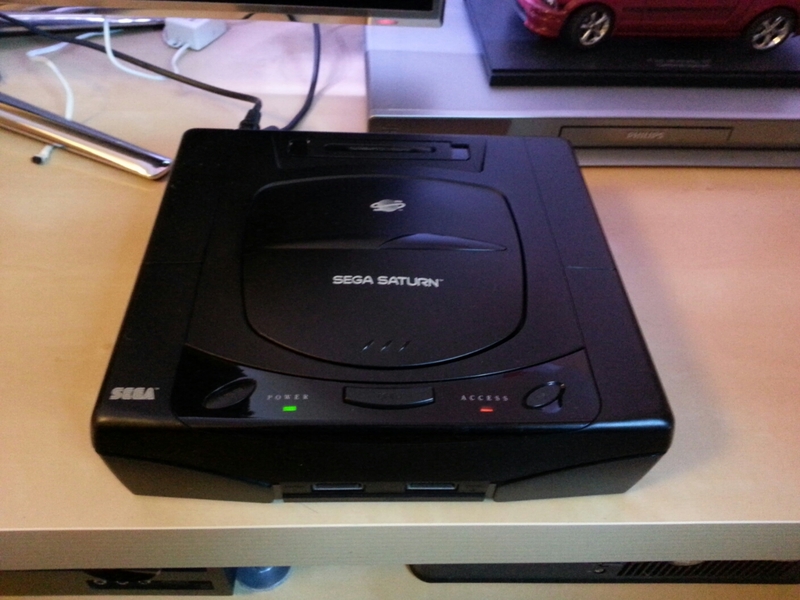 My Sega Saturn, in all it's mighty 32-bit glory! It's a quiet console, with a fairly noiseless cd-rom, even when it's working hard on reading cd's. The SS and PS1 were of course (together with the Nintendo 64) the last generation of fan-less consoles and therefore run almost silent. Behind the cd-rom lid there is a slot for memory cards, but unlike the PS1 the SS actually has built in memory too! I like this idea. When you boot the Saturn you need to enter the date and preferred language. I believe the PS1 had no record of date and time. My SS asks me this each time, but this because I need to replace the motherboard battery. Which is easily accessed at he back of the console. It's nice to be able to save a few games without purchasing an expensive memory card. If you plan on playing many games though, you need to buy a memory card. The Mark 1 and Mark 2, Saturn controllers. I've got both the generations of controllers for my SS, the Mark 1 and 2 models. 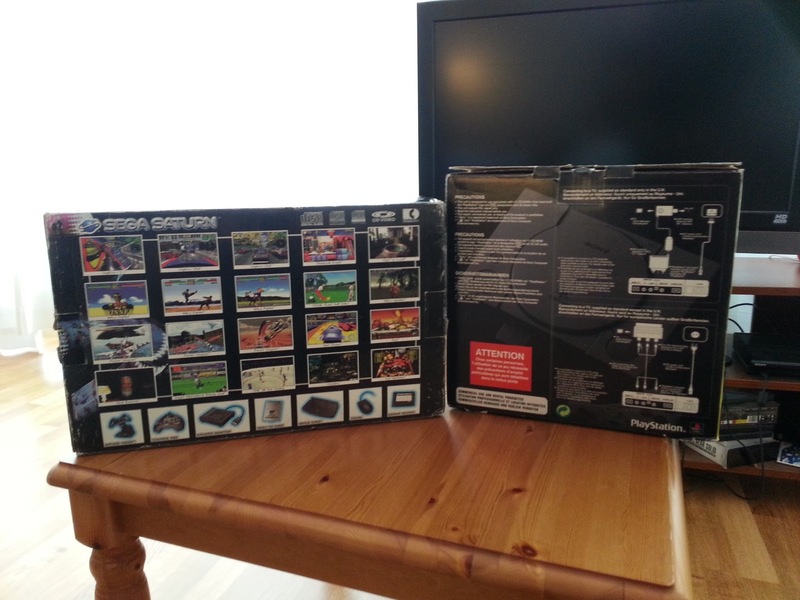 The latter was re-released a few years ago as a PC USB controller and is often touted as the best d-pad ever made. Perfect for 2D games and especially fighters. I bought the USB version at the time and I must say I must agree, it's fantastic for 2D games! The SS version is identical, and actually is the original SS controller, released at launch in Japan. The Mark 1 model controller, which was bundled with the SS for it's US and Europe release (Sega believing western gamers needed a larger controller), is kind of a strange looking controller. The buttons are nice and springy and the d-pad works well, but the shape of it is better on the Mark 2. The shoulder buttons on the Mark 2 are improved from the Mark 1 which are hinged at the top and give hardly any feedback when pushed, just a slight click. The Mark 1 is also quite large compared to Mark 2. The games! It's all about the games isn't it? Well, it kind of is what makes and breaks a console. Luckily the SS has many great exclusives titles brought straight from their arcade successes, at least on paper. Sadly the home versions were in the first wave of releases broke by bad ports to the SS. For the ultimate comparison test of 32-bit 90's wonder consoles, I dug out my old PS1 and asked a friend to try out a few games from about the same year and genres. Side by side, the 32-bit rivals of the mid-nineties. First out were the racing games. An absolute genre favourite of mine. It was the classic battle; Daytona USA (Sega's beloved arcade hit from '93/'94 ported to the Saturn in '94/'95) versus Ridge Racer (Namco's arcade hit, a company which Sony cleverly got on their side). Daytona USA is known to be a bad port, and man did we notice. The draw distance is truly terrible, rendering the road a few hundred yards in front of the car and the framerate being somewhere near 20 fps. Ridge Racer however, has great draw distance and very stable framerate. The picture is also much clearer in RR, with less grain further into the distance. While arcade titles don't matter now, in '94/'95 this would easily have made you pick the PS1, simply seeing how much better RR than Daytona USA from an objective point of view. Staying with the racing spirit, we took the following years titles up for a race; Daytona USA: Championship Circuit Edition versus. Destruction Derby 2 (the original Destruction Derby was released on both the PS1 and SS and were mostly identical, the sequel however, never made it to the SS) for a stock car racing comparison of 1996! Straight off the bat Daytona CCE looks way better than the first Daytona on the console, it has a much cleaner picture, really stable framerate and a somewhat improved draw distance. It proves that a steady framerate and clean picture goes a long way to make a game playable, even a decade after release. Daytona CCE does however look slightly different from the original Daytona and sort of ends up being a new title in the series. DD2 fights well back, with a solid framerate, and a far superior physics engine, with detailed crash physics and visual damage. Much like Daytona CCE, DD2 doesn't have a very spectacular draw distance, perhaps RR was one in a few that managed this much better amongst the early games for PS1/SS. I'd say it's a kind of draw between Daytona CCE and DD2; Daytona looks slightly cleaner while DD2 has a much more advanced physics engine. We also gave one of my all time favourite arcade titles a spin; Sega Rally. This SS port was done by Sega's internal team AM2. It proved the SS could run it's arcade games just fine, and helped develop Daytona CCE. It's fast and smooth and has the fantastic SR feeling present. We gave it a spin against V-Rally on PS1, but this was kind of an unforgiving comparison. SR being from 1995 and V-Rally from 1997. V-Rally looks far better and probably marks the point were the PS1 development started to leap far ahead. It's much more detailed, and has a cleaner and superior picture quality. 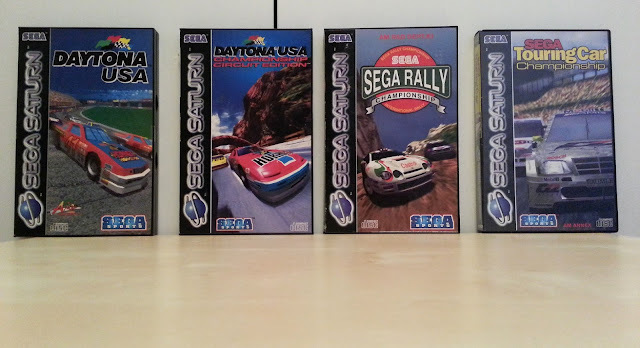 SR wins on the feeling of the cars though, Sega knew how to nail great gameplay back then. Similar comparison is Sega Touring Car Championship to Gran Turismo. It's an unfair comparison, but again proves that the PS1 leapt on further to new graphical heights. STCC is a terrible port, with one of the worst framerates I have ever seen in a game. A shame, because when we booted up STCC and stood at the starting line it actually looked like SS racer with mid-life PS1 graphics. Sadly it was unplayable. 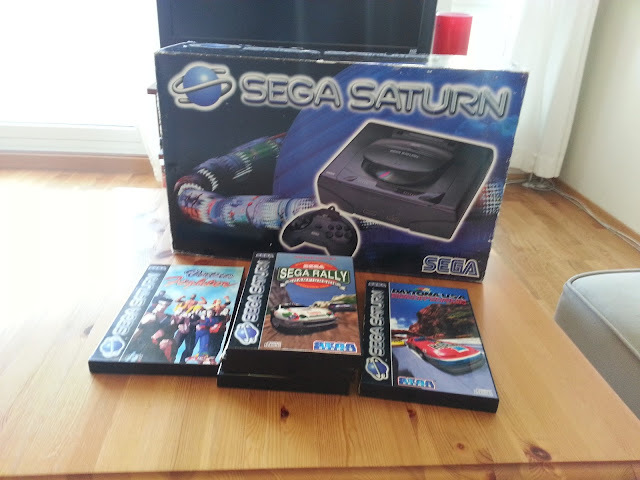 Some of Saturn's most famous racing exclusives. Beat 'em ups then. 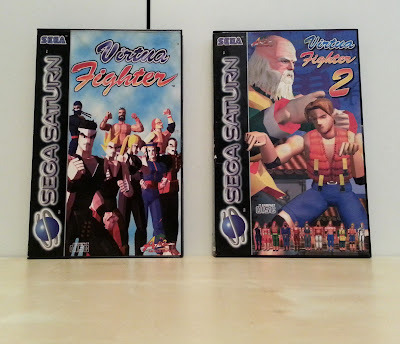 First on the line is Virtua Fighter, a game brought to life after making an animated pit crew in Virtua Racing and the creator thinking it would be cool to make a 3D beat 'em up. VF looks very dated, with it texture-less and extremely blocky fighters. This port isn't even a very good one either. I can see why gamers thought Tekken and Toshinden on the PS1 were far better. We quickly switched over to VF2 for the test, and brought out Tekken 2. VF2 actually really impressed us! It's a fantastic port and has an amazing framerate. It's smooth, has very clear and upgraded graphics It's a giant leap from VF1 and it actually put Tekken 2 to shame. VF2 turned out to be the most impressive SS game we tried of them all. Virtua Fighter is one of the best beat 'em up series ever made. The last game we dug out for comparison, was perhaps the most direct one of them all; Resident Evil. The exact same game for each console! We watched the intro of both versions, and maybe hoped the SS version featured the uncensored Japanese one, no such luck. Ingame the games look almost identical, the SS version having a little more grainy picture. This was mostly prominent in the intro video, which is a real movie and not CGI. The character models are newer textured and modelled in the SS version, due to it's later release. The SS version also has a faster dialogue loading and does not have the terrible cd-rom reading sounds the PS1 has. Otherwise the PS1 version probably is the best one for picture quality. However, they are so identical that you are going to have the same experience and enjoyment regardless of which version you choose. 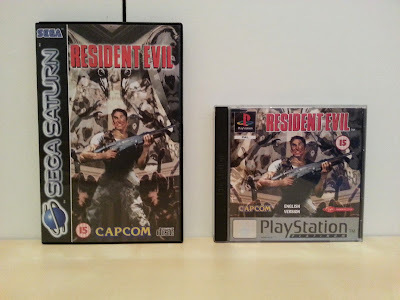 Capcom's survival horror classic, an excellent title regardless of system. 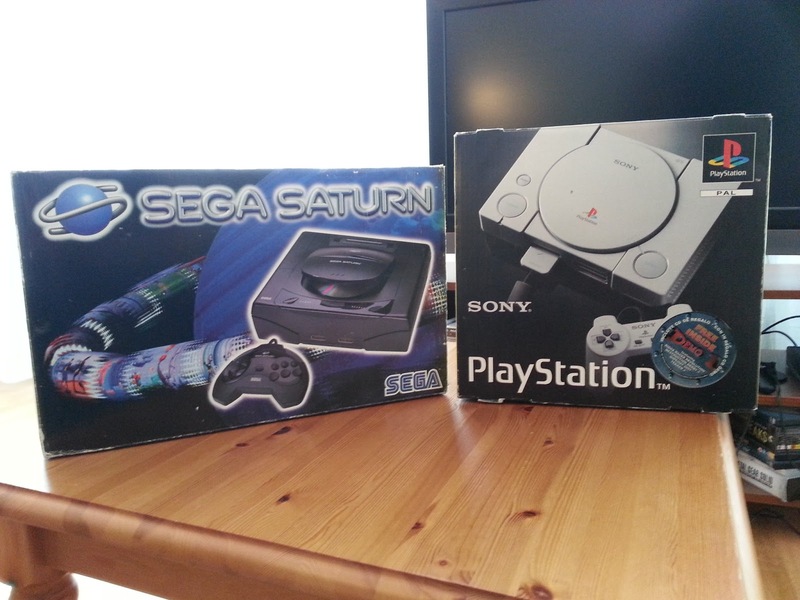 It's been fun buying a console that I personally favoured for the PS1 back in the day, but ultimately didn't buy due to it's failing release and non-presence here in Norway. It's also been a trip down memory lane and given me a better picture of how the SS faired against the PS1. I may not end up playing on the SS so much considering how the games have aged, but it's cool to have the option and being able to. The SS has even inspired me to buy the Daytona USA HD version on Xbox Live and enjoying the game with the way it was meant to be like at the arcades. Personally the titles that have impressed me most on the SS have been Sega Rally and Virtua Fighter 2. SR still manages to hook you in with it's great handling and VF2 looking technically impressive and proving not much has developed in the fighting genre other than graphics. The Saturn was an overpriced, underpowered and mismanaged console, yet it's worth delving into, simply because it's a history lesson in early 3D gaming. The SS clearly is a console which deserved a far more even sales number together with the famous PS1. If the Saturn had benefited from a large sales, who knows what amazing titles we would have seen.